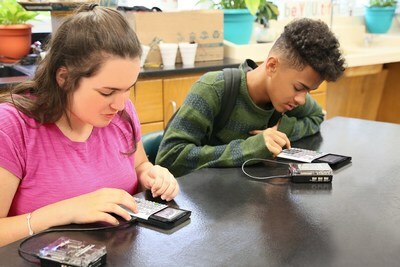 DALLAS, March 20, 2018 /PRNewswire/ -- Today, Texas Instruments (TI) issued a coding challenge for students: develop a solution using TI education technology that helps improve daily lives. Maybe an alarm clock that shakes the bed until a person wakes up, or something related to the environment, like a smart irrigation system that conserves water, or a device that tracks a home’s electricity consumption in real-time. Starting today, teams of up to five students, ages 13 to 19, can enter the TI Codes contest by submitting a design proposal. "At TI, we want to help teachers keep students engaged in math and science as visions of summer vacation start dancing in their heads," said Curtis Brown, former teacher turned math specialist for TI. "This fun, hands-on contest combines coding, collaboration and some spirited competition to keep students focused on learning important STEM concepts as the school year comes to a close." The contest is simple to enter and includes four rounds. In the first round, students submit a written proposal outlining an everyday process they want to improve and their proposed solution. These proposals will be evaluated by a panel of judges from TI, who will determine which teams move on to the next round. As teams advance, they will start building their proposed design. Ten semi-finalists will receive a TI graphing calculator, a TI-Innovator Hub with TI LaunchPad™ Board, and a $50 gift card for additional supplies to build their design and showcase it in a video. Form a team to enter the TI Codes Contest today at www.TICodesContest.com.